My craft space that is! This week has been busy and tiring, not because it was March Break necessarily, but because my hubby and I have been tag teaming it to take care of a baby who JUST WILL NOT SLEEP! I am so tired, I’ve had no energy to stamp! Fortunately, my hubby had time and energy to get a fabulous shelving unit for me on AMAZING sale at IKEA. It was regular $60 down to $20-ish! YEEEAAHHH! I really needed something else behind my craft table because my ribbon was on the floor! So, here is my space now. Everything on the shelving unit was on either the desk or on on the floor where the shelving now sits. The photo is crappy-sorry. I should have used a flash but it seemed bright enough at the time. I corrected the brightness and exposure so now you can see everything but it just looks weird! **SIGH** The glass table top (with love written on it in various languages!) and trestles are from IKEA. The table top was $80 and the trestles were on sale for $20. (All Canadian $s) I’ve had the office chair for ages. 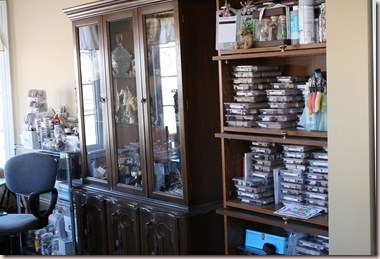 The china cabinet houses our video/DVD/cords etc plus some extra things I don’t use much in the bottom part. Typical china cabinet pretty things are in the top. The new shelves to the left of the cabinet. My NEW SHELVES! Looks like a store huh? Pathetic! (pathetically fun!!) Can you tell I was a sewer first, them a crafter? My thread colours are way too garment-ish! The stack of paper right under the thread is my Basic Grey pads, behind that and to the left are pretty much all embellishments, flowers, ribbon plus all my beads, baubles, buttons and bling! 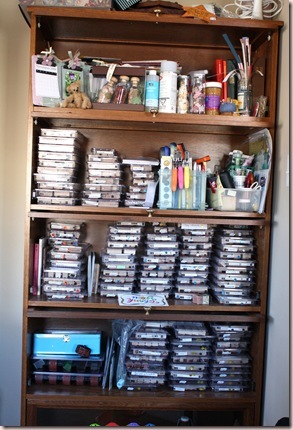 The striped box on the second row fits 4.25×5.5″ cards PERFECTLY, behind that is stuff I don’t use much. The Kraft photo box appropriately holds chipboard, my markers are on top. I have room for another magazine file, both of which I will eventually cover with patterned paper. To the left of the magazine file, I have my dies except Sizzix alphabets, as well as Cuttlebug plates and embossing folders. 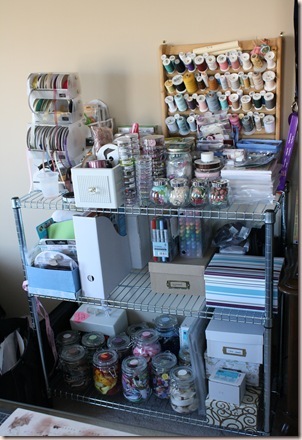 The bottom shelf from left to right, white embroidery thread case, ribbon in IKEA jars~ colour-coded, BB SU! ink, chipboard in 12×12 format in a folder, white and gold swirl box-liquid ink and watercolours with EE re-inkers on top, White and golf toile box with misc junk!, solid white box with clear stamps and underneath hidden are my crochet cotton and silk embroidery ribbons. WHEW! This is my not-fully-cleaned-up-yet table! 🙂 Most of the things on here stay, yes I can create in a mess, because I like stuff closer more than I like it neater. Clockwise starting at the upper left: bin with upright storage for colour wheel, chalks, watercolour crayon tin, pencil crayons and my embossing kit-embossing powders, brush, emb buddy and small powder pal. Next should be empty space but has bright blue cards my DS made and hasn’t given yet, then a bin filled with misc stuff like candies, a stamp handle I was going to use as a felt ink applicator until I bought the Tim Holtz version… My ‘punchable’ scraps in the lid of the aforementioned bin, two garbage cans- one for paper/recycling, one for garbage. My Ott light, my tool caddy full of scissors, foam dots, stamp wheel handles, adhesives, paint brushes plus those little round containers of SU buttons, eyelets and brads in the drawer at the bottom. I’d prefer to keep them over on the new shelf with all the other bellie choices but they keep the drawer from collapsing! LOL!! Then my stamp scrub sits vertically next to my ink pads in their need-to-be-decorated cardboard holder. Works great and was SOOOO cheap! My most used pads are in there including most RR, EE, SS plus Stazon black and brown, Adirondack black and Versamark. Next is a spinning tool/pen caddy with bone folder, pens, pencils, stamp cleaner, eraser and tape. The stick with white rolls on it is a bamboo skewer with Eclipse tape, double sided photo tape and cheapie foam tape on it. 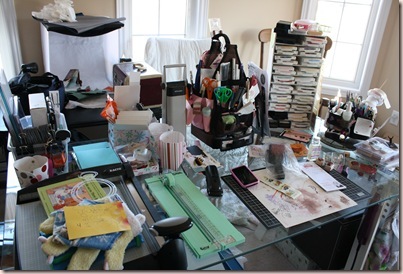 Then a couple stamp sets I need to clean, my workspace which is about 8″ wider than it was now that I got my new shelves and my two paper cutters. 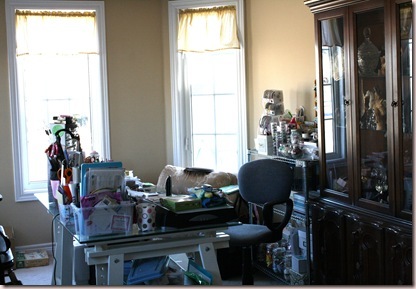 In the first photo, you can see my easy chair in the background under the right window, on it’s seat are my punches. They are in cases but it they barely close so they just sit out there. No one ever comes to watch me craft anyhow. The only people who do come by to watch are crafters who get their own table to work on. That reminds me, you can see my photo booth set up behind the main table; it is on a card table guests get to use. So where is all my paper? Under the table! Because the table top is clear glass, I can see through it into this bin with all my cardstock plus a few of my current fave paper packs. You can really only see the lid, but the brown storage box to the left under the trestle holds my loose sheets of patterned paper in labelled-by-topic accordion files. A twin sits under the other trestle with various brands of patterned paper packs and the cardstock and patterned paper/cardstock portions of my scrap kits from Sweet Pea Scraps (link on sidebar); the bellies and ribbons from the kits live with their kin! My Scor-Pal lives under there and on the front of the trestle are stamp sets that need to be returned to the shelf plus a couple I use often. You can see my covered Clip-It-Up under the photo booth table. It has all of my alphabets, stickers, rub-ons and printed fabric sheets. Along with paper storage, the other trestle houses my VERY small sewing machine and my Cuttlebug! OK, I know that was long, if I knew how to save half and do it in two posts I would! The only major problem I have in this lovely room is the windows! Yes, I know they are great but everything fades so quickly! 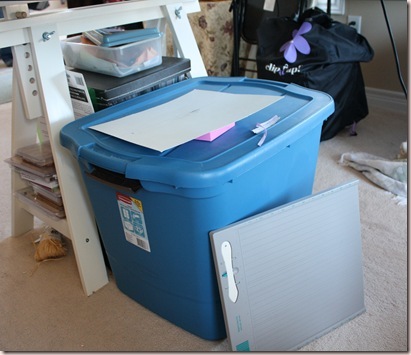 I would much prefer my old method of storage with my paper easy to see in transparent bins and my Clip-It-Up uncovered but I am noticing fading already because I leave the lid off the cardstock bin ALL THE TIME! Oh well. I’m just glad I have a dedicated space unlike so many others. Hope my organized but superficially messy room inspires you to keep your stuff neat! Helps you to remember what you have so you don’t buy doubles! so fun to get a peek into where you create Rebecca! !